A cactus is a common houseplant that can thrive in the right indoor conditions. There are actually two varieties of cacti grown as houseplants. Both are popular and readily familiar. The desert cacti are the more "traditional" cacti, usually covered with spines or hair and often growing in paddles, balls, or obelisks. Forest cacti grow in wooded areas, ranging from temperate forests to subtropical and tropical regions. The most well-known forest cacti may be the Christmas cactus. Both desert and forest cacti boast beautiful blooms, but they have very different growing habits. Temperature: During the active growth period, cacti prefer hot, dry temperatures, ranging from 70 F to more than 80 F. In the winter, the plants prefer a cooler period, down to 55 F. In their desert habitats, many cacti are accustomed to very chilly nights. Do protect them from very cold winter drafts. Water: In the spring and summer, when the plant is actively growing and blooming or both, water whenever the compost begins to dry. During these waterings, make sure the plant is thoroughly watered. During the winter rest period, nearly cease watering. Only water if the plant begins to shrivel. Potting Soils and Repotting: Pot into a fast-draining cacti mix. If one is not available, amend the regular potting soil with inorganic agents like perlite to increase drainage and aeration. 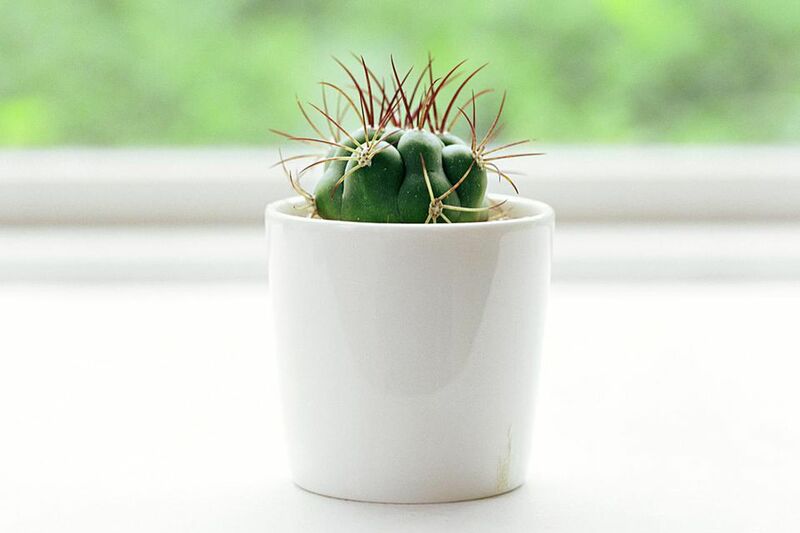 Cacti are slow-growing plants and will rarely need repotting. Also, remember that many species of cacti will bloom better when they are slightly underpotted. Common Problems: The most common mistake with desert cacti is overwatering in the winter, which will cause rot either at the base of the plant or the tips of the growing areas. If the rot is advanced, it might be necessary to start new plants from cuttings or discard the whole plant. Cacti are also susceptible to pests include mealybugs and mites. Light: These plants like bright, but not direct, sunlight. Move them outside during the summer. Temperature: During the growing season, they have a wide range, from 55 F to 70 F. During the rest period, a colder spell of 50 F is essential. Water: Water as a normal houseplant during the summer months and when the buds begin to show. During the resting period, only water when the soil is dry to the touch. Potting Soils and Repotting: Use a regular potting mix.​ Repot at the beginning of the growing season. Fertilizer: Fertilize during the growing season with a standard fertilizer. Reduce fertilizer during the growing season. Blooming Tips for Christmas Cacti: Coaxing multiple blooms from a Christmas cactus (or the closely related Easter cactus) takes a little planning. Before you want the plant to flower, cut it back and induce a rest period when watering and fertilizer is reduced, and the plant is kept cool (about 50 F to 55 F). After one to two months, move the plant to a warmer place and resume watering. Buds will soon begin to show. It is also essential to move the plant outside during the summer. Common Problems: As with succulents and desert cacti, these plants should not be watered heavily during the rest period. Root rot will result. Advanced root rot can only be treated by taking new cuttings and starting over. Fortunately, these plants root easily from cutting. Failure to bloom is usually caused by an inadequate rest period and not taking the plant outside during the summer months or both.